We heard you want to start your own vlog! Whether you’re doing it for your own personal use or looking to start up a YouTube channel, the quality of camera you decide to use is just as important as your personality or the material you bring to the table! 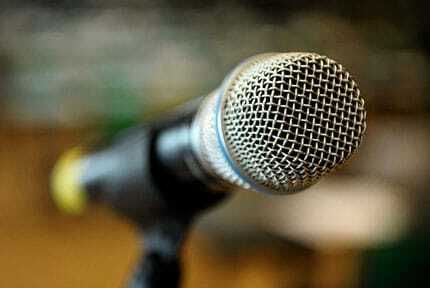 No matter how entertaining you may be, no one wants to watch something with poor video or audio quality! We’ve dug deep and found a wide variety of cameras to get you on your way to a vlogging success! Whether you’re looking for a beginner product or the cream of the crop, we have it all right here for you, along with the answers to any questions you may have. So, without further ado, we present to you, the best vlogging cameras that 2019 has to offer! There are quite a bit of features to take into consideration when looking at cameras, however, we’ve created a simplified table listing the main features of each one, so you can more easily compare and contrast one another and help rule some of the options out that you feel don’t suit you as well as others. So, there are undoubtedly a lot of options to choose from, however, each blogger has their own needs and style. That means that not every camera is a one-size-fits-all, right? Our table has hopefully narrowed down your options, but as you want to make an educated decision, we’ve listed detailed reviews down below for you. Vlogging isn’t the easiest thing in the world to be good at, and it’s definitely not for everybody, so we figured we’d start out with, well, a good starter camera. The Sony W800/B is just that; a camera that will provide you with a good-quality experience, without the cost, so if you end up not liking it, you won’t have wasted hundreds of dollars. The W800/B is easy to use, with a quite literal “Easy Mode” to minimize the layers in your menu, and make shooting more about the enjoyment, rather than hassling with the operation of things. Even if you’re not an experienced vlogger, you’ll notice right away the “zoom” feature, which has an optical zoom of up to 5x. Most of us have experience taking panorama shots on our smartphones, so the use of the Sweep Panorama Mode should go smoothly, as well. This really increases your photo-taking abilities, by stitching beautiful images together to create an impressive panorama image. If you’re looking into taking more steady shots, then the conveniently-named “SteadyShot” will help maintain the sharpness of your photos or videos by stabilizing images and eliminating most blur and noise. The camera is also lightweight, making it perfect for travel. It shoots in 720p which will do the trick for beginners, but the more advanced options on this list will obviously provide you with better quality. The camera is charged by USB, which makes it easy to use again and again without worrying about batteries dying. Overall, if you’re looking for a camera to begin vlogging for under 100 USD, then this is a great one to select! 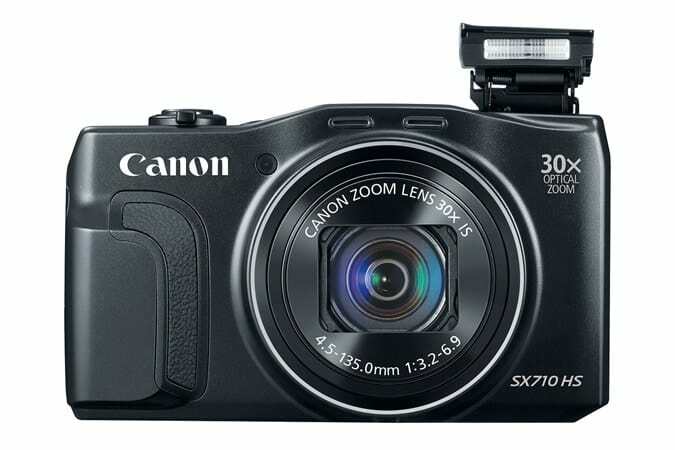 The second on our list, is the Canon Powershot SX710 HS, which is an excellent vlogging camera for beginners. While it has much more advanced features than the previous item on our list, but it still very easy and straightforward to use. While it has a compact body that makes it great for traveling, it packs a pretty big punch. 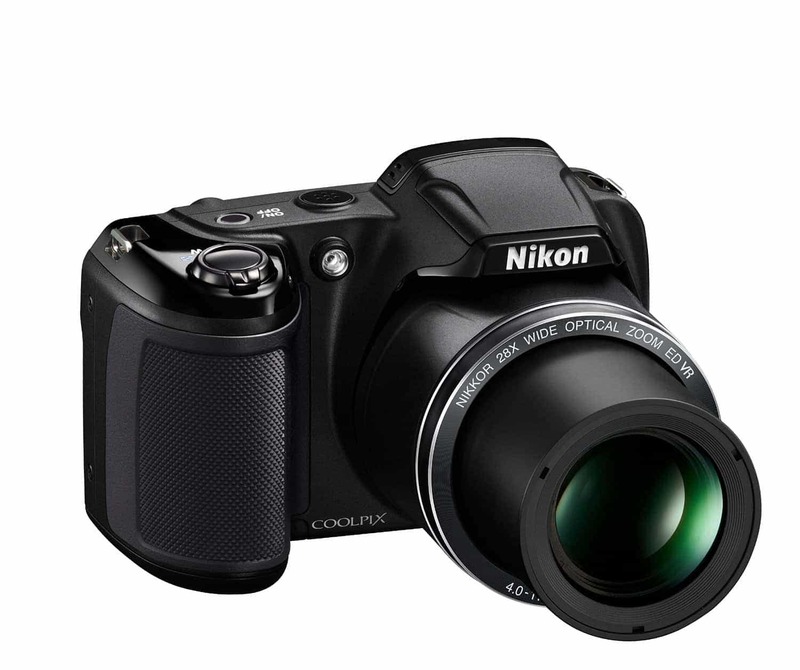 It comes with a 30x optical zoom, and takes your videos up a notch with 1080p Full HD. If you’re still a little wobbly when it comes to recording or shooting, it also features an Intelligent IS and Zoom Framing Assist to make sure your products come out as clear as possible. 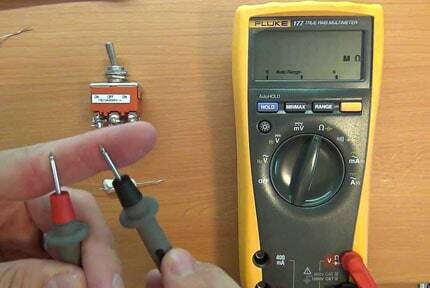 It may just save you some money and the hassle of using a tripod! The Dynamic IS is a twist on this but keeps your video steady when walking either backward or forwards. In Story Highlights, you can easily add music to the background of your videos, without having to go through a complicated process, which is ideal for beginners, as well. It comes with built-in WiFi and NFC (Near Field Communication) which makes sharing and transferring photos to smartphones and laptops simple. When you’ve captured a good video, you’re bound to be excited and want to share it right away! This helps with that! Remember that with NFC, this typically only works with Android devices, however, the built-in WiFi allows you to easily share just about anywhere. 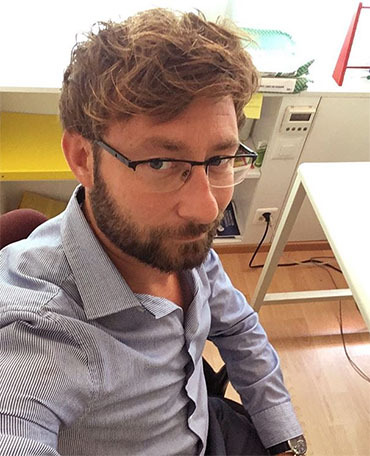 Feel free to post in real-time to social media networks, and connect to almost any iOS or Android device by using the Mobile Device Connect button. If you’re still getting the hang out things but plan on filming in low-light areas, then the Canon HS System will not let you down, as it’s primed for that kind of performance. The Creative Shot mode is there to assist you in creating beautiful works of art by using Canon’s technology to analyze a scene, subject, and exposure to apply any of 46 filter options that best apply. Zoom Framing Assist, Intelligent IS, and Dynamic Assist keeps you steady and clear of noise and blurring. 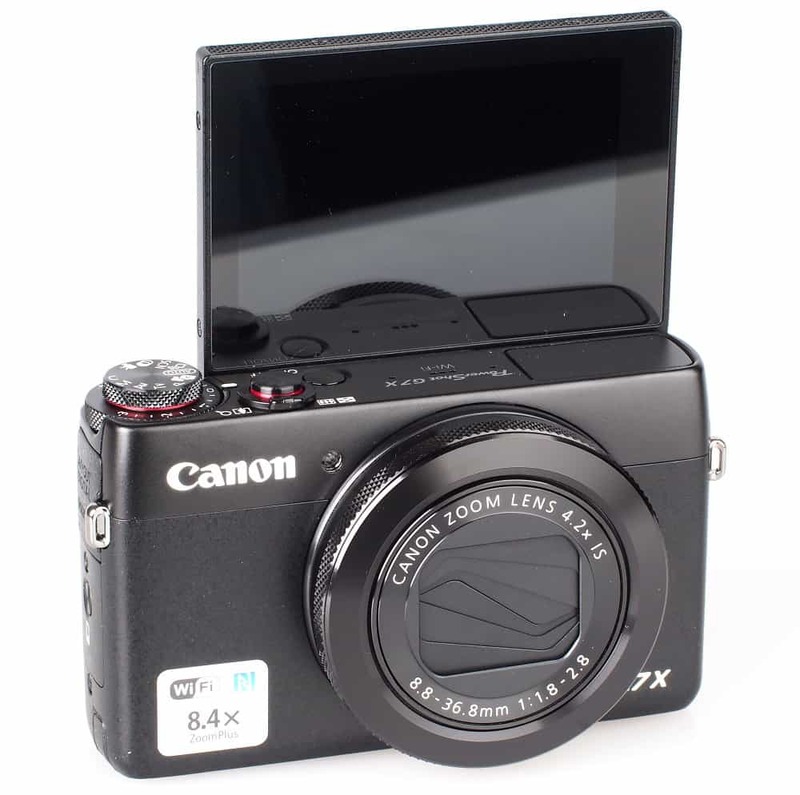 Third on our list is another Powershot by Canon, but this time we’re talking about the more advanced camera model, G7 X. This is actually one of the most popular YouTube vlogging cameras, used by numerous YouTubers (RomanAtwood, Shaycarl, iJustine, and many more), and there are some pretty good reasons why. Right off the bat, you’ll notice that the camera is lightweight, compact, and features an impressive flip screen that maximizes your recording capabilities. The impressive new 24mm wide-angle lens takes advantage of the large sensor, which allows you to give more expression and add new possibilities to your videos. If you even want to capture macro shots or videos very close up, the G7 X can do it with precision. A high signal-to-noise ratio ensures minimal noise and distortion while maintaining great dynamic range, especially in bright areas. Really, the focus of the camera is on the video-recording capabilities, as you can now record full HD in mp4, which is simple with the addition of the DIGIC 6 Image Processor. This makes it great for YouTube videos as the result even looks great on large screens, such as laptops and even a large-screen HDTV! The control ring makes it simple and convenient to switch between shooting modes on the fly. The control ring includes an aperture, speed, focus, flash, and ISO. Intelligent IS keeps things steady and clear, even when shooting in dimly-lit areas or without a tripod. When you’re shooting video, the system will select between Dynamic IS, Powered IS, Macro (Hybrid) IS, and Active Tripod IS modes. The LCD screen is a feature that we have to mention again, because it’s a feature that isn’t so common among many cameras. The screen can tilt up to 180 degrees, so you can take a selfie with ease, or more importantly, film yourself while seeing yourself in real-time so you can tell if you still have that piece of spinach in your teeth from lunch or need to fix your hair. It also encourages creative framing, as it provides so many different angles to shoot from. You’ll feel completely liberated, and with a resolution of 1.04 million pixels, the glare-free display comes in crystal clear and full of real detail. Once you’re done filming, you have the option of transferring and accessing photos through means of built-in WiFi technology, or the Mobile Device Connect button which lets you see your photos on the later versions of iOS and Android! As the mp4’s format makes for small files, transferring is easier, and also allows more space on your memory card! The Sony Cyber-shot DSC-RX100 is a camera that packs a lot of punch in a tiny body. It is the first in the world to feature a 20.1 MP 1” Exmor RS stacked back illuminated CMOS, with high-resolution 4k movie recording, with direct pixel readout and no pixel binning. In case you didn’t know, this is incredibly advanced in opening up image possibilities. I mean, the shutter speed is at an astonishing speed of up to 1/32000! The Anti-Distortion Shutter System can capture quick-moving objects while maintaining their original shape. Due to a DRAM chip now integrated into the sensor structure, the readout speed is over 5 times faster than their previous model. That’s quite an improvement if you ask us! Let’s go back to what you’re really here for, though: the high-resolution Clip-4k movie. While the camera can fit in your pocket, it delivers beautiful, crisp video quality. The 1” Exmor RS CMOS sensor gives off less moire than most 4k movies and also maximizes high-bitrate shooting of up to 100 Mbps for a seriously professional level of video. If you’re looking to slow things down, you now have the ability to capture super slow motion HFR movie of up to 40x slower than real time. With PlayMemories Camera Apps, you can now add new features and apps that reflect your personal style. There are apps that increase the ease of posting to social media, there are shooting apps like time lapse, and much more. Much like the G7 X, it features a multi-angle, 3” LCD screen, making it easy to take self-recordings or various angles like over crowds, or low-to-the-ground shots that would typically be difficult to capture just the way you like. Right away, you’ll probably notice the Canon EOS Rebel T5i is a DSLR, which comes with a lot of attractive features, but is also noticeably more heavy that our other products listed, so far. If you’re looking for a natural look while filming, the sensor and processor coincide to produce well-detailed, clear imagery with minimal noise and blur, even while shooting in dimly-lit conditions. We, as well as many others in the industry, consider this camera a revolutionary powerhouse. As a vlogger, you’ll no doubt appreciate the ability to shoot in Live View with pin-point precision and autofocus that are quite similar to a camcorder. To assist in the high-quality shooting process, Dual Pixel CMOS AF provides rapid yet accurate autofocus during Live View still image capture. These features maximize the capabilities of the Vari-angle 3” LCD screen. This gives you the ability to shoot yourself/selfies with ease, or in hard-to-shoot locations. To further maximize your shooting capabilities, Canon has ensured it’s compatibility with 103 Canon EF lenses. Having an interchangeable lens is a feature not seen in many of the vlogging cameras on the market today, and can provide you with practically limitless creative possibilities. Bringing scenes into focus is essential when shooting video, and much like your standard camcorder, the Rebel T5i does just that. When switching between subjects, it’s quite evident that focus comes naturally and accurately. Don’t worry about losing focus while the subject is moving; we don’t think the EOS will let you. Once it locks onto a subject, the focus stays and doesn’t let go. The EOS Rebel T5i features the highest pixel count of any APS-C sized sensor in EOS history, which is huge in the vlogging world. The camera’s 20. 2 Megapixel CMOS sensor records a gigantic 5472 x 3648 pixels, keeping the image clear even with the biggest enlargements, because of its marvelously high resolution. If you’re looking to get more into action shots, then you’re in luck. The camera is capable of shooting up to 7 fps, and along with a fast shutter, could even capture a cheetah running across the desert crystal clear. If you are having trouble finding a camera that will shoot without interruption (like so many do), the EOS 70D will automatically split files larger than 4GB. The camera comes with an internal stereo microphone so your fans can hear you clearly, along with a wind filter just in case you’d like to shoot at your next camping trip or outdoor concert. However, if you’d like to change things up a bit, it also comes with an external microphone input, in case you’re thinking about future upgrades. The sound levels can be manually or automatically controlled (up to 64 levels) to make sure your audio is just as precise and pleasing as the visuals. You didn’t think a DSLR of this level would come without wireless technology, did you? Now, you can control your shooting settings like aperture, shutter speed, focus, and more, all from your iOS or Android smartphone. How cool is that?! This video for blogging can be used in Live Mode all from the handiness of your phone with the EOS remote app installed. The wireless technology also makes it simple to transfer and save images directly to your smartphone from the EOS 70D. If you have a friend you’re shooting with or you’d like to exchange your work with, the Full DLNA compatibility makes it easy to do so. You can easily share between your camera and any other DLNA products, including HDTVs, smartphones, and more. If you’re looking to start blogging for money, you’d be wise to look into this one! Switching things up a bit, let’s move onto the Nikon Coolpix L340. The low-price superzoom camera features a 28x optical zoom, which is attractive to many new vloggers. It’s great for beginners just moving into intermediate territory. While there isn’t a whole lot that’s been updated between the L340 and its previous model, it’s a tried-and-true, reliable camera that’s just as great as taking quality video as it is good on the pocketbook. One noticeable difference between the two is that Nikon has incorporated a vibration reduction to help reduce the effects of the inevitable camera shaking that will come will normal use; especially when recording or shooting in active environments. On the external side of things, the L340 is identical to the L330, which also shares the same 20. 2MP CCD sensor. HD 1280×720 video recording is also featured, although it is no match for the 4k video available on some of the more advanced options on our list. Given the fact that it is more of a beginner/budget camera, there aren’t as many features as some of the other products we have listed here. It comes with 6 special effects filters, which are handy, but nowhere near the capabilities of the dozens of filters, some others come with. However, there is a scene-detecting auto mode, as well as their Smart Portrait mode that, easily put, makes people look more photogenic by softening skin and letting you know if someone is blinking. The L340 is pretty compact which makes it nice to take along with you into the city, or traveling, in general. The thicker yet ergonomic design, complete with the rubberized grip, make it easy and comfortable to hang onto in seedier areas (if you find yourself in that kind of environment). The 3” LCD screen provides a clear image with an accurate color reproduction and brightness. The 460k-dot resolution is nowhere near as sharp as our more advanced options, it will do if you’re just starting out. The menu is pretty easy to use, which again is great for newbies, but isn’t anything really outstanding, all things considered. One notable downside is that it uses AA batteries, which can be quite the hassle if you’re out shooting somewhere where you don’t have access to buying new batteries or don’t have a recharge station available. Overall, it is a basic camera that performs well for the price and is great if you’re a beginner vlogger who can upgrade once you become more popular with viewers. Now, onto our final product, and possibly the most well-known product to the general public, the GoPro HERO5 Black. You’ve seen them before; the people jumping out of airplanes or scuba-diving in the Caribbean…but how exactly? What are they using to capture these amazing videos? The answer is, a GoPro. If you want the cream of the crop in a field of GoPros, then opt into the HERO5 Black. An extremely small and convenient camera packed full of features is something every vlogger or traveler should have if they want to make the most of their adventures. The HERO5 is the most powerful one released to date, and can capture the coveted 4k Ultra HD Video at up to 30 frames per second. 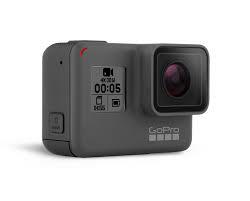 The great thing about the GoPro, is that it has amazing features, but as they’re all so convenient and straight-forward in their design, both professionals and amateurs alike can use them with ease. Vloggers may not think of GoPros when first starting out, but even though they’re so common and tiny, they capture beautiful detail and an amazing quality of video footage. If you’re thinking of vlogging on-the-go, traveling, or adventuring, then this should be one of the top items on your list. Capturing an immersive experience from first-person view will make your viewers feel like they’re really there, jumping off that cliff or diving underwater. That’s right, underwater! The HERO5 is waterproof up to 33ft (10m), and that’s only without a case, which you can purchase for very cheap. The 2” display may look quite small, but that doesn’t mean it’s lacking in quality. The image has an accurate color reproduction, complete with great detail. You can actually play and preview your shots right away, as well as change your settings and trim footage, all from the GoPro, itself! If you decide to place the GoPro on a helmet attachment or on a chest strap, it may be hard to operate manually, but luckily, there is a voice control option for hands-free operation! Just simply say a command like, “GoPro, take a photo”, and there you have it! Think of it kind of like having a Siri built-in. If that’s not for you, no worries; the one-button control is as simple as you can get. A single press of the shutter button turns the camera on and starts recording. It wouldn’t be a very good action camera without quality stabilization, now, would it? The Advanced Video Stabilization feature captures accurate, smooth video, no matter where it’s located. Even fast-moving objects are captured well, with minimal blur. Exposure control, audio control, and GPS location tagging are extra features that are also pretty cool to have, and will make your videos more appealing to viewers. So, how do you share the amazing videos you’ve captured? With a GoPro Plus subscription, you can automatically upload photos into the cloud for simple viewing, editing, and sharing. How To Choose The Right Vlogging Cameras For Me? This is where it gets a little bit difficult for beginner vloggers, and those who just want to know more about the vlogging cameras, but are having a hard time deciding. Not to worry, we’ve made a useful guide to lead you along the path to success! As you can see, we have cameras listed of all different types of image quality. When it comes to vlogging, video quality is obviously the most important as that is what people are watching. As a beginning vlogger, it’s not quite as important, as your content is, however, it’s still something to consider. As your vlog gets more popular, you can upgrade to a higher level of quality, like 4k. We personally recommend looking for something at least capable of recording at 1080p, also known as “Full HD”. We have quite a few listed here that meets these standards, but if you’re just starting out, don’t worry as much about this. We’ve listed a couple of 720p cameras here for those on a very tight budget. If you aren’t on a budget or are absolutely looking for the best, then you have to go with the 4k or “Ultra HD”. Your videos will remain pristine and crystal-clear, even on bigger screens. This all depends on personal preference. It’s obvious that lighter-weight cameras are more convenient, however, there are many vlogging cameras of very high quality that are heavier, like DSLRs often are. If you’re planning on setting your camera on a tripod or another solid surface, weight won’t matter as much, but if you’re carrying it around, you may rethink buying a heavier one. No one likes looking at out-of-focus or blurry video footage, which means your viewers won’t want to watch your channel if your vlogs look like that. If you plan on vlogging at all while moving, then you need to have a good quality of optical image stabilization. While YouTube and editing software can help fix this, it won’t compare to the quality of the stabilization built-in the camera. This is a feature often taken for granted by vloggers, but is equally as important as the visual aspect of your videos. No one is going to listen to someone either too loud, too quiet, or whose audio is going in-and-out of focus. Each camera comes with a good-quality microphone, but there are some that will pick up ambient noise that won’t sound great. There are some cameras that come with an external microphone jack, which is the best option if you want the best quality of audio. This one is pretty obvious. You’re going to want to look for a camera with a lens that offers a great quality of video while shooting at a relatively close range. As most vlogs are shot a matter of a couple feet away, this is really important, and not all cameras have this (the ones on this list do). There are other smaller factors that may be important to you, such as the level of user-friendliness of a menu, perhaps, or the ability to download other apps onto your camera. These are all listed in each description of the products we have in our guide, in order to answer any questions you may have. 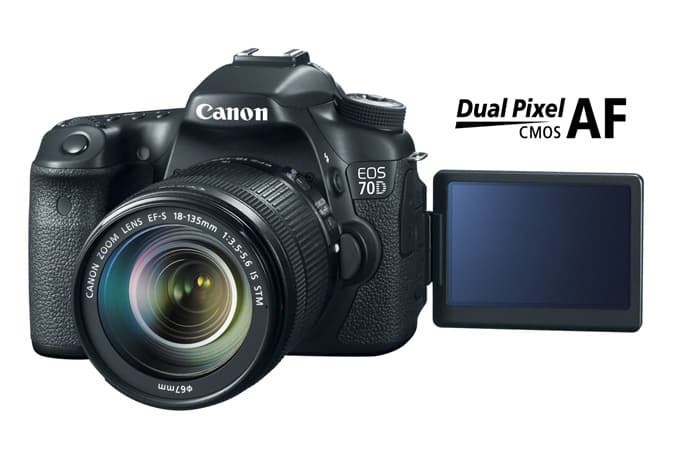 All in all, these cameras will service your vlog well, however if we take things like budget out of the equation, there is one that stood out to us, quite clearly, which was the Canon EOS 70D. It was a close tie between the GoPro Hero5 Black, and they’re both some of the very best cameras for vlogging. 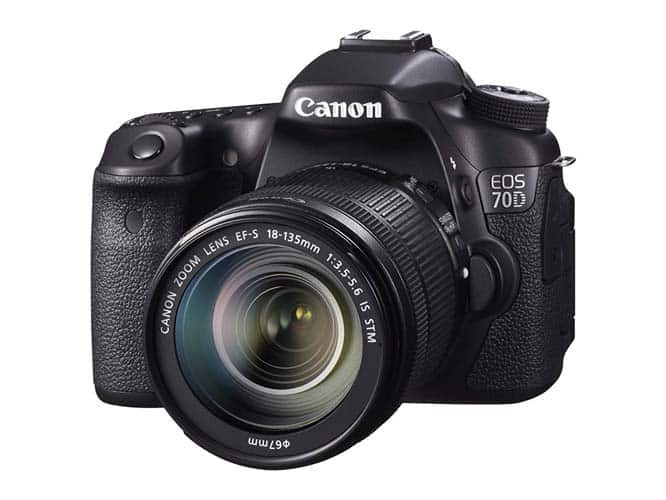 However, we selected the EOS 70D because it just came with many more features and variables. It shoots professional-quality video, and you can manually adjust the controls with ease. You have the ability to shoot while not even being at your camera, because of the wireless capabilities. You can share easily between devices like HDTVs, other cameras, and smartphones. The multi-angle screen is perfect for shooting video of yourself, or capturing video at otherwise-difficult angles and locations. If you’re looking for a straight to-the-point, beginner-friendly, yet high-quality option, the GoPro Hero5 Black will fit you perfectly. We hope you’ve found the best vlogging camera for you, and look forward to seeing you on YouTube!